One of the most important entertainment elements to an event is selecting a great keynote speaker and other presenters for the agenda. When hiring an outside speaker to fill the role, event planners may either contract directly with a professional speaker or rely on the expertise of a speakers bureau. Whether it’s an internal executive, industry leader, or a professional speaker, a successful program will identify speakers early in the planning process. Diane Goodman, president of The Goodman Speakers Bureau, Inc. in Windsor, CT is a recognized industry leader in providing professional and nationally-recognized speakers and entertainers for corporate and organization events. She is the expert author of Survive The Search: How To Target & Choose The Best Professional Speaker, a 12-page primer for meeting and event planners. Goodman structured the guide as a checklist of helpful tips and questions that beginning and experienced meeting planners should address internally before reaching out to hire or select a speaker. First and foremost, as with any event, advance planning is always helpful, and at times critical, to landing the best speaker for your event. It’s much easier to secure the best speakers by planning at least six to 12 months prior to the event. The norm for booking a professional or well-known speaker used to be a year. Of course, this isn’t always reasonable or realistic, and today, bookings have been known to be made only a few months in advance. If you can help it, don't leave yourself in a panic during crunch time. Only once these tasks are thought through (and perhaps others specific to your event or meeting), should you begin the keynote speaker search. A keynote speaker can play several different roles for a conference or meeting. Does your meeting require a corporate speaker or would your audience be better served by an inspirational or motivational speaker? 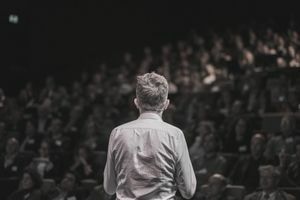 Going through this checklist will not only provide a better framework from which to conduct your speaker search, but it will save you time on the back-end in getting internal approval on your first choice of speaker. Once you know the conceptual direction of the meeting, you will have a better experience finding an appropriate keynote speaker. Where most event planners get stuck is not in the search and selection process itself, but rather in the negotiation of keynote speaker fees. Professional keynote speakers with a published book can run companies upwards of $10,000 to $20,000 not including travel costs for an event. A New York Times best-selling author, on the other hand, can collect as much as $40,000 per speaking engagement. While these numbers can feel extraordinarily high for event planners new to the keynote speaker space, you must approach the fees relatively. How does the speaker's fee compare to say the cost of the catered morning breakfast or the number of people expected at the meeting? Since event planners serve as the internal and external face of the business meeting, this type of structured approach to speaker selection will help obtain the needed internal approvals for a budget as well as moving a program forward. When planning a meeting, one of two scenarios tend to occur: the business meeting date is approved without content, or the business meeting date is not approved without confirmed content. Goodman’s approach recommends that event planners should have a thorough understanding of the meeting, who will be attending, what messages are being communicated, what type of speaker is needed, and what has worked in the past. These steps, combined with some scheduling flexibility and advance planning will result in a successful program.